Built by Britain’s first Prime Minister, Sir Robert Walpole, this “English Castle”, Houghton Hall is one of the stateliest examples of Palladian homes in all of England. It was designed by some of the leading architects in England at the time, including James Gibbs who added the domes and William Kent, who designed the interiors. One of the centerpieces of the property is the surrounding gardens and park, which span 350 acres. They’re not only home to a herd of white fallow deer, but also 150 varieties of roses. In addition to being open for tours, Houghton Hall is home to the Model Soldier Museum, with more than 20,000 soldiers on permanent duty there. 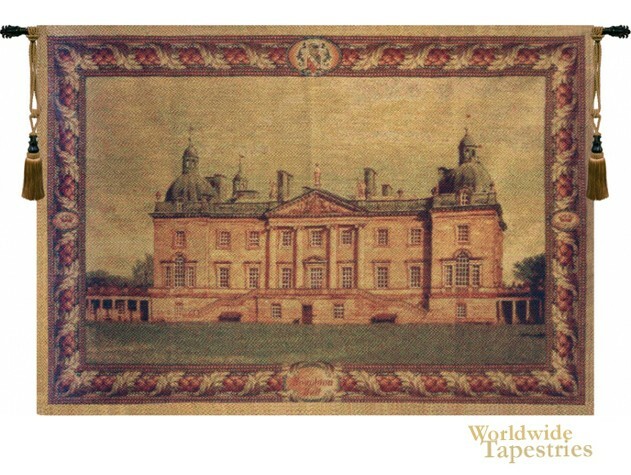 This tapestry shows the front view of this English Castle, with its stately exterior, a hallmark of Palladian style homes of the time. This tapestry is unlined and has a tunnel for easy hanging. Note: tapestry rod and tassels, where pictured, are purchased separately. Dimensions: W 72" x H 56"